As my Polish Yiddish-speaking Nana used to say, “When ten men say you’re drunk, go home and sleep it off.” Allow me to translate: If a number of people say the same thing, it must be true. Public consensus is that San Diego deserves its own opera house. With this maxim in mind, the San Diego Opera is elated to announce “The San Diego Opera Lover’s Ball” gala event, which will be held Saturday, February 23. 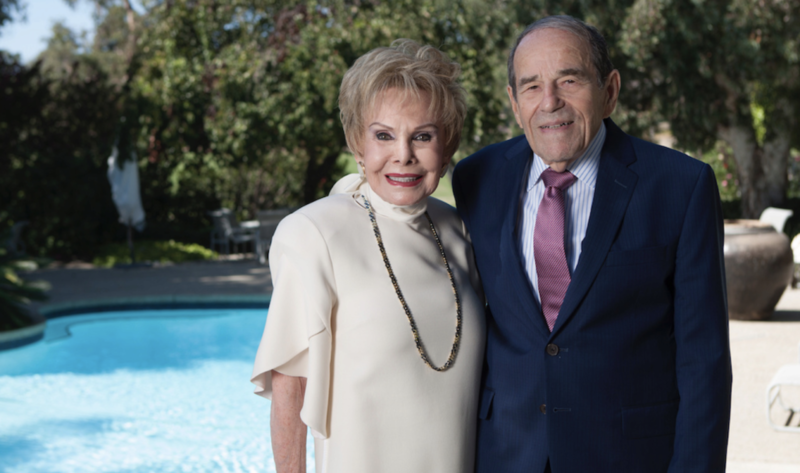 This year’s honorees are Lee and Frank Goldberg, who have contributed generously, and have lovingly fostered the growth and development, not only of the San Diego Opera, but many other community institutions as well, including Seacrest Village, UC Moores Cancer Center, UCSD, San Diego State University and Words Alive. I was surprised to learn that the Goldbergs were not born with librettos in hand, nor were either of them nursed to the strains of Mozart or Wagner, but were introduced to opera by friends, after a pre-opera dinner at the Westgate Hotel. They found themselves enthralled by the voices, costumes and scenery. While Lee claims Madame Butterfly as her favorite, Frank appreciates all of them equally. The philanthropic couple has been married 66 years, and have shared their enthusiasm and love of this art form with their three children and six grandchildren. Both told me, in a phone interview, that they are thrilled and humbled to be selected as this year’s Gala guests of honor. Since their initial foray into the world of opera, the Goldbergs have enjoyed opera in Europe and New York City, and feel that San Diego’s Opera has developed and risen to great heights. In 1992, Lee became President of the San Diego Opera Board of Directors. As Producer’s Circle members, the Goldberg’s largess has brought opera superstars to our town, including the likes of Luciano Pavarotti, Placido Domingo and Beverly Sills to name just a few. Since the tumultuous period of 2014-2015, thanks to the Board, the company has made a wonderful comeback. Both of the Goldbergs concur that the new regime has done a terrific job. While the Goldbergs would love to see San Diego Opera have its own dedicated facility, they are grateful that the Civic Center graciously houses the performances at present. The acoustics are great, and the seating plan allows for fantastic visibility, they said. Lee said that we are lucky the center is available. This dynamic and dedicated couple credit the General Director David Bennett and the Gala’s Chair, Sarah B Marsh-Rebelo, with the Opera’s success. Marsh-Rebelo’s first opera experience took place at the age of 10,during her childhood in England. At the Royal Festival Hall, this impressionable, empathic spirit was introduced to the magical and transformative world of opera. Owing to her mother’s indoctrination of poetry, classical music, literature and theater, the pump was primed, and opera was the culmination of all things beautiful. While she told me she prefers to sing in the shower, a place that is “acoustically sensitive and allows my voice to sound wonderful” she also believes that atrophy is not a given. “If you use your voice, it is astounding what can happen,” Marsh-Rebelo says. This tone of inspiration and optimism seem to be a trademark of Marsh-Rebelo’s. The Gala Chair was quick to point out that San Diego Opera is honored and overjoyed to receive support from individuals and corporations. It is also heartwarming to see that San Diego Opera lovers extend beyond our southern border, and many of our neighbors from Mexico are attending the performances as well as serving on the Board. Marsh-Rebelo offers kudos to General Director David Bennett, whom she describes as “courageous” for bringing not only the tried and true operas, but modern masterpieces to San Diego audiences. Bennett introduces topics that “share the nuances of human behavior.” In March of 2019, audiences will be invited to Jake Heggie’s Three Decembers, a story that examines hopes and resentments in a family, as they try to resolve their differences. The Board, benefactors and Bennett are all working to create a dedicated, world-class opera of which San Diego can be proud. The San Diego Opera Lover’s Ball is a celebration of possibility and enchantment. There is a music and dance between the staff and leadership and with a Spanish flair, the U.S. Grant Hotel will be transformed for the night. The room will be decorated in colors informed by Joan Miro and Pablo Picasso. Beautiful floral arrangements designed and donated by Green Florals will grace each table. The US Grant Executive Chef, Mark Kropezynski has created an impressive menu that will follow a cocktail hour in the Palm Court. Hors d’oeuvres will be passed, accompanying a silent auction. The auction proceeds will go towards the Company’s Programming and Community engagement projects. Additional entertainment will be provided by Encore Event Entertainment. San Diego Opera deserves a home of its own. To purchase tickets, visit www.sdopera.org/opera-ball.